PASIG CITY, Philippines- The groundbreaking book, Hilot: The Science of the Ancient Filipino Healing Arts by Dr. Bibiano S. Fajardo and Ma. 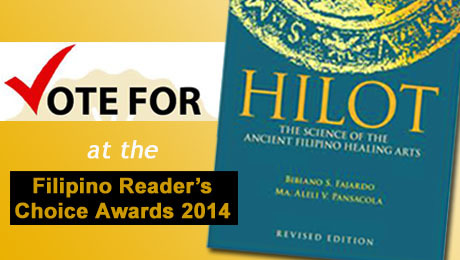 Aleli V. Pansacola is one of the nominees in the upcoming Filipino Readers Choice Awards 2014 under the Nonfiction category. The selection of winners for the Filipino Readers Choice Awards 2014 is of three phases—nominations, public voting, and panel judging. Winners will be recognized at the awarding ceremonies in November, during the Filipino Reader Conference. Share the good news! Invite your loved ones and friends to vote for Hilot! Hilot book featured on Anvil Publishing’s website! Is Hilot just a type of massage? ← What should I NOT DO after my Hilot session?